Welcome to the new website of the Zabalaza Books publishing project. 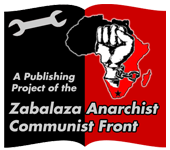 We are an anarchist communist publishing project linked to the Zabalaza Anarchist Communist Front. The views within our publications are not necessarily shared by the ZACF as a whole. They are published for self-education, raising awareness, initiating discussion, for use by study groups, for tabling and outreach, etc. All our publications are available free for download from the links in the categories on the right. Any requests, comments etc. can be made via the Contact form at the top of this page.